Respawn’s new battle royal game Apex Legends has tonnes of cosmetic unlockables, ranging from new character outfits to special animations for when you execute a downed player. All of them can be earned either by progressing in the game or by spending real money on loot boxes. 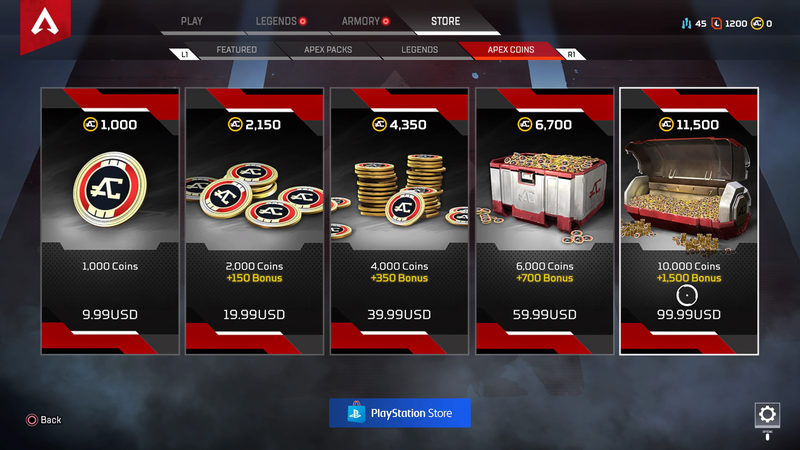 Here’s a breakdown of how Apex Legends’ microtransactions work. How much does the game cost up front? Apex Legends is free to play and comes with six of its eight characters unlocked. 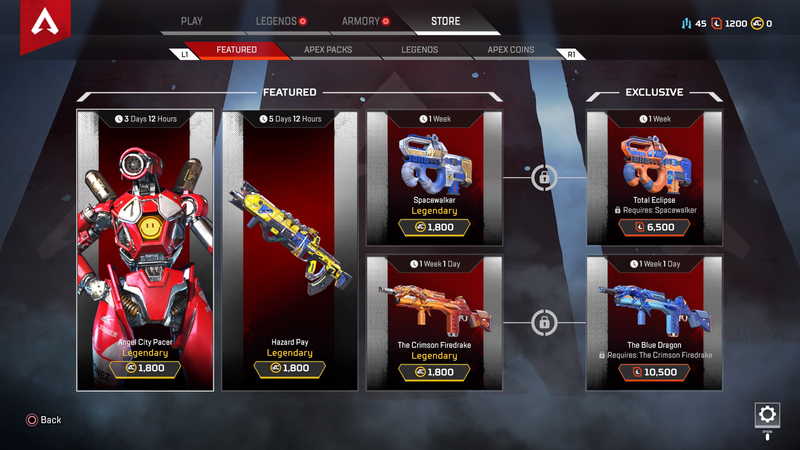 Getting the other two, the Toxic Trapper Caustic and the Holographic Trickster Mirage, requires spending either 12,000 legend tokens, one of Apex Legends’ two in-game currencies, apiece, or spending 1,500 Apex coins, the equivalent of £12, for the pair. Beyond paying to unlock the two characters, the rest of the game’s microtransactions revolve around loot boxes called Apex packs, which contain either items or the materials, called Crafting Metals, to unlock items. These items can be broken down into the following categories: character skins, weapon skins, banners, poses, quips, and finishers. You can earn up to 45 loot boxes for levelling all the way to the current player cap of 100. Currently, you’ll have to purchase loot boxes with real-world money after that. How much do microtransactions cost? This is the tricky part. Apex Legends has three different currencies: Crafting Metals, Legend Tokens, and Apex Coins. Each individual thing in the game, save for the two characters, can be unlocked by spending Crafting Metals, but Crafting Metals can only be earned by opening loot boxes. While you’ll earn loot boxes as you level up from completing matches, they can also be purchased for 100 Apex Coins, the equivalent of 80p. Some nice things about Apex Legends’ loot boxes is that they will never drop duplicates, and also that your odds of getting a legendary item go up the more boxes you open. Everyone is guaranteed at least one Legendary item every 30th loot box, and the odds of what rarity the stuff you get will be are shown on the screen before you open the box. That said, since you can’t pay for Crafting Metals directly, opening loot boxes, either by earning them in-game or paying real money for them, is the main way of unlocking the clothes and stylised accessories that will make your preferred fighter feel unique. The game does have a store where you can buy things directly with Apex Coins on a rotating basis, but it only includes four items at a time. The game has hundreds. Since the number of loot boxes you can earn just by playing the game is capped at 45, it appears not. It’s hard to know exactly how long it will take the average person to reach level 100 and earn all of their free loot boxes, but it’ll probably be a minute. Of course, most people will probably only be concerned about unlocking the coolest stuff for their favourite character. As just one example, you’d need 4,800 Crafting Metals to unlock all four of Bloodhound’s legendary skins. Even if you were guaranteed one rare stack of Crafting Metals in each loot box you opened, it would still take you 160 loot boxes to get enough to unlock all of the legendary skins. 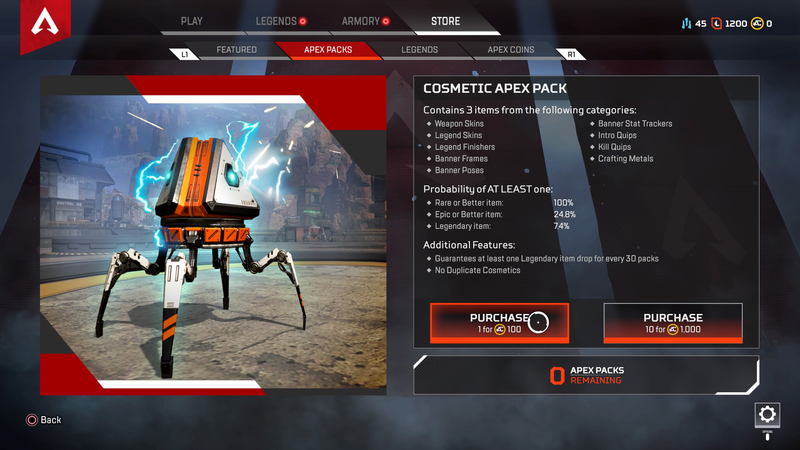 Alternatively, the robot character Pathfinder’s Legendary Angel City Pacer skin is currently for sale in the Apex Legends store for 1,800 Apex coins, the equivalent of £14.40. For comparison, epic skins in Fortnite cost 2,000 V-Bucks, the equivalent of £16. No. Apex coins can only be purchased with real money. No. Everything is purely cosmetic. While you could argue that players might be more or less easy to spot and identify depending on which skins they’re using, none of Apex Legends’ items affect the underlying game. On the one hand, loot boxes are gross, but on the other hand Apex Legends is perfectly fun even if you decide not to spend any money on its microtransactions. The fact that the game’s loot boxes won’t give you duplicates and ensure you get a legendary item every so many tries makes the system feel slightly less icky than other games. Like other battle royale games, Apex Legends will get a seasonal battle pass starting in March. While EA hasn’t yet revealed how much it will cost, we know it will reward players with season-specific cosmetic items as they rank it up through playing the game. Each season will run approximately three months. Battle passes have become more popular over the last year in part because they provide a nice alternative to the randomness of loot boxes. Instead of simply rolling the dice and hoping to get something good, battle passes let players pay a certain amount of money upfront for a list of guaranteed rewards they can grind toward. When Apex Legends gets its own next month, it could bring a different balance to the game’s microtransactions.